“IVIS” was established on 11.03.1989 г. The latter at first is registered by the Sofia City Court as a Sole Trader headed by Engineer Mr. Ivan Anchev. 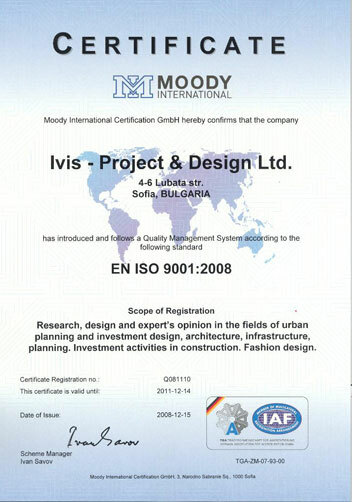 In 2004 the firm changed its status - reregistered as Limited Liability Company and the name was changed as “IVIS-Project&Design” Ltd. and its business purview was augmented to include design, property sales, interior and fashion. At present the company is managed and represented by Architect Mr.Emil Lekov together with deputy managers Landscape Architect Mrs.Violeta Doneva and Designer Mr.Ivailo Emil Lekov. The company has office and correspondents in UK-London as well. Total staff employed by the company totals 52 experts specialising in urban design, architecture, engineering, communications, economics, geography, landscape designers, computer programmers et al.. In its activity “IVIS-Project&Design” Ltd. is successfully cooperating and employing experts from the National Center for Territorial Development and Housing Policy, Agrolesproekt, Administration of Geodesy and Cartography and other private and governmental consulting bureaus. The qualification and the professional experience of the specialists with which the company works guarantee the quality and the timely execution and delivery of all contracted work. “IVIS-Project&Design” Ltd. is financed from orders and contracts with public and private companies, municipalities and individuals and citizens from home and abroad. The activities include a wide range of investigations, designing and expert consulting, in the sphere of territorial structure and investment design. The business purview of the company broadly encompasses, among others, the study, design and provision of expert consultancy in the field of territorial designation and allocation, as well as investment planning and scoping. specialized investigations ordered by companies and municipalities. Structural plans of parks and sports facilities in the towns of Razgrad, Panagurishte and Strelcha. “Vacation village locality „Ovinache” on the land of Bansko”; Hotels, residential and production buildings, etc. Taking into consideration our own experience in the elaboration and proceedings of the general structural, detailed structural and investment projects, architecture design and constructions in their whole, we believe that we are in the position to help the execution of your intention for designing and constructing and meet all your requirements, needs and ideas. Our main task is to satisfy all Your dreams, expectations, needs and requirements. Our motto is: service with great quality, good manners, speed and high-professional standards. harmony and unity between architecture and the environment. You can entrust us with your dreams and we will create for you the ideal surroundings for living, entertaining, working and relaxing.